KT Interior Designs is owned by Karen Ann Temple (KT). 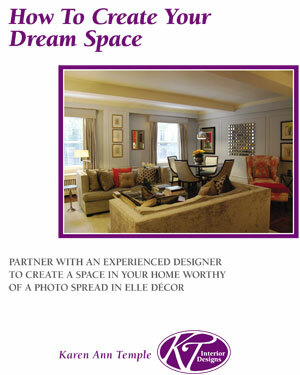 She has over 20 years professional experience in residential decorating and design. Karen’s passion for all things design began in the 1980’s when she had the good fortune to travel extensively throughout Europe, South America, North Africa, and the Middle East. It was during these years that “KT” had the opportunity to discover a multitude of foreign cultures, languages, art & history, exotic cuisines, and more.